We've partnered with the release of Wonder Park in cinemas everywhere April 8 to offer you the chance to win the ultimate family holiday! Wonder Park (Cert PG) is in cinemas everywhere April 8. Voice cast includes: Jennifer Garner, Matthew Broderick, John Oliver, Mila Kunis, Norbert Leo Butz, Brianna Denski, Tom Baker, Joe Sugg and Caspar Lee. It’s a 2-part trip where your family first travels to Chessington World of Adventures with South Western Railway. You’ll have breakfast in the Safari restaurant, overlooking the giraffes, Zebras and other wildlife before spending two amazing fun-filled days at Chessington Theme Park with VIP passes and a meet and greet with the characters from the film. The next adventure continues in the New Forest where you’ll head down to the 5 star Treehouse resort, Chewton Glen for 2 nights of pampering, relaxation and fun at the beach in your very own luxury treehouse with a private terrace and hot tub. For your chance to win all you have to do is follow the link below! 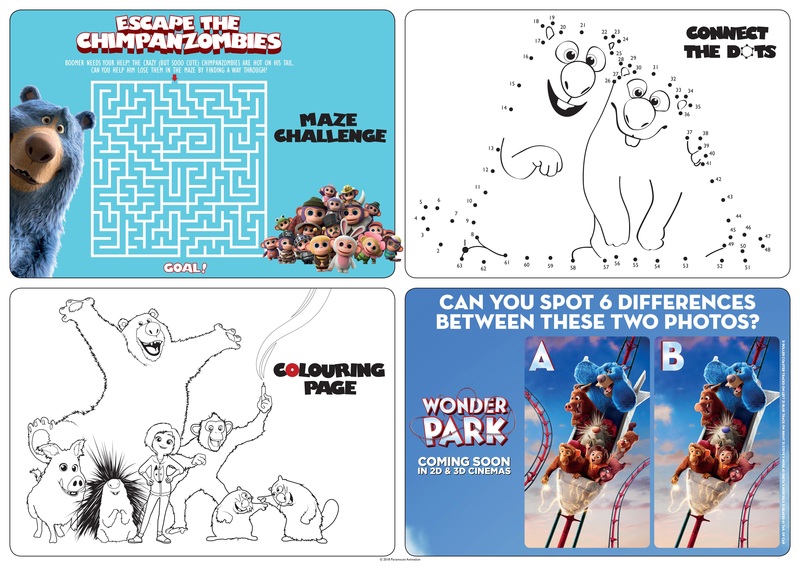 Treat your family to some Wonder Park fun this Spring holiday season with the downloadable Wonder Park activity sheets below. Perfect to pass the time on your day out with South Western Railway! Find out more about the magical world of Wonder Park on the pages below! The prize is for two adults & two children (2 – 15 years old). Prize-fulfillment will be managed by Performance. Dates of travel are 1st June - 3rd November 2019. Excluding all British national holidays. Prize is subject to availability, has no cash alternative, is non-transferable and non-refundable. At least one person travelling must be aged 21 or over. If winner is under 18 then at least one of his/her guests must be his/her parent or guardian. Accommodation based on two adults & two children (2-15 yrs. old) sharing one standard family room at Chessington, and one Treehouse at Chewton Glen. The hotels will take a credit card pre-authorisation or cash deposit to cover any incidentals. Height and weight restrictions will apply to certain rides/attractions in each park. The winner has the choice of two options for their travel: Standard Class rail travel included from South Chessington to New Milton. This includes Taxi fare from Taxi station-hotel-hotel-station. ALTERNATIVELY Car hire is included for three days. Driver must be 21 or over and have held a licence for at least a year. Driver will be required to leave a credit card imprint with the car rental agency. Observance of speed and traffic laws and refuelling are the responsibility of the driver. Winners are responsible for any fines, parking violations or traffic offences relating to the vehicle. Rental includes Loss Damage Waiver, Liability Insurance Supplement, unlimited mileage & Young Driver’s Surcharge if aged under 25. Personal insurance is not included. £500.00 spending money is included in the prize, and will be sent by bank transfer 2-3 weeks before travel. Except for the three guests permitted to you as part of your prize, you are not allowed to bring any additional family members or guests on the Prize trip. Your guests may not be selected through any further contest, promotion or commercial event. You and your guests must travel on the same itinerary. Once selected, your guests may not be changed without the express consent of Paramount, which Paramount may grant or withhold in its sole discretion. © 2019 Paramount Animation. A Division of Paramount Pictures. All Rights Reserved.